Weeny religion: The killer fantasy of the arrogant child of the Goddess. The proof is all around us. What the Earth, it’s ecology and Nature strongly communicates through all five senses is this one simple reality. In whatever form creation occurs, it is a birthing process out of which stuff is created, nurtured and allowed to mature to the point of making its visible appearance. The Eternal Male did not start things but was summoned by the Eternal Female to bring about the mortality of humanity. To put it more bluntly, human existence did not happen because of a supposed divine weeny. Looks to me like life begins as a result of female presence. We belong to The Goddess, not the Patriarchal Fraud. When the male is necessary it’s only to perform one special task in order to set in motion reproduction. Patriarchal religion is nothing more than Men strutting and prancing around waving their weenies and bragging about seed, with which they themselves can do nothing until the female takes the seed from them and turns it into something sacred. Its theology is patriarchal, the dogma and rituals are patriarchal, judgmental and ignorantly arrogant. So there is the Goddess who brought all things into being, and there is “God” the thing imagined by men to support the condemnation and subjugation of women. More on the strutters trying to upstage the doers. Historically going way way back, 75 to 80 per cent of a clan’s subsistence came from women’s finding and gathering activities. Not weeny waving men with a spear, a knife and a bow. Most primal tools were connected to women’s digging needs. Women were more the first users and managers of fire. Women were the first potters, weavers, textile-dyers, hide-tanners. Women were the first to gather medicinal plants – making them the first doctors. Women were the first to communicate with and teach communication skills to their offspring. So who did more to develop language? Not the grunters waving their weenies that’s fer sure. Who first started marking and tracking time, marking painted pebbles and sticks? 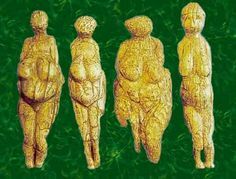 And the first divine image found painted on rock, carved in stone or sculpted from clay was the image of the human female. When men want a woman’s opinion they will give it to her. Such is the legacy of patriarchal religion based on a not-so-divine weeny.